The answer to the question 'Does the world want another Descent game?' was answered a few hours ago with a resounding 'Yeah go on then'. 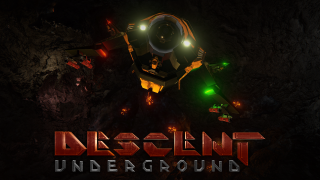 Descent: Underground, the spiritual-turned-actual Descent sequel from many people wot made the first ones, has been successfully Kickstarted, hitting its $600,000 goal with, blimey, only $1,773 to spare. That means that none of the stretch goals have been reached, but the devs are now digitally begging over on the official site, if you missed the boat and would still like to contribute. Read this for a big breakdown of Underground, explaining how it's similar and how it's different to the old games, or look above for a new trailer that shows the topsy-turvy FPS in action. The expected release date is March 2016, so you have time to play/replay the first three games in the meantime.